Epilepsy affects an estimated 12 million people in South Asia. More than half of this population is comprised of young people. Besides the sizable quantum of disability adjusted life years (DALYs) there is a hidden burden associated with epilepsy as these young people are often unable to complete their education, get appropriate jobs, and marry. Marriage, a socially compelling and momentous occasion in the lives of people with epilepsy as in the case of others, has not received the attention it requires from a psychosocial research perspective. To complicate matters, some of the unique social attributes of marriage in much of South Asia pose an enormous challenge in the lives of young people with epilepsy. Marriages in the region are universal. That is, over 95 percent of the people choose to get married in comparison to the 60 percent in the rest of the world. An overwhelming majority of marriages are arranged. That is, the parents/elders in the family find and finalize marital partners. The problem with arranged marriages is that the prospective bride and groom do not meet before marriage, and hence are unable to reveal significant discrediting traits to their prospective partners. Epilepsy is often hidden for fear of breakdown of marital negotiations. The consequences of hiding epilepsy during marital negotiations are immense and include breakdown of marital negotiations and poor marital satisfaction and outcome (an increased rate of divorce) in addition to serious health implications for the individual with epilepsy. Sadly however, these consequences have not been formally studied. 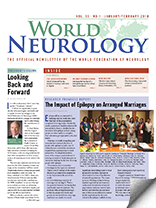 A highly considerate World Federation of Neurology (WFN)-International League Against Epilepsy (ILAE) grant enabled us to form a working group to tackle the immensely intricate and problematic issue of arranged marriages in people with epilepsy in South Asia. We were able to initiate a clinic-based knowledge, attitudes, and practice survey of unmarried and married people with epilepsy in the following centers in South Asia: Dayan and Medical College, Ludhiana (GS) Vedanta Hospital, Gurgaon (Dr. Atman Ram). Further, the grant enabled us to meet on Aug. 12, 2017, at Hyderabad to discuss the findings of the survey. Investigators from each site attended the meeting. 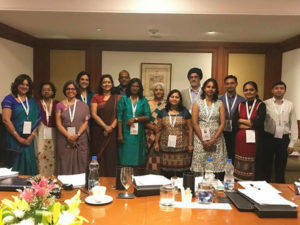 In addition, a social scientist (Dr. Manjistha Banerjee), neuropsychologists (Dr. Urvashi Shah and Dr. Parveen), social activists (Yashoda Wakankar), neurologists (Dr. Pravina Shah, Dr. Manjari Tripathi, Dr. Hitant Vohra, Dr. Archana Verma, Dr. Sanjaya Fernando, Dr. Lekhjung Thapa, Dr. Siby Gopinath, Dr. Sudhir Sharma and myself), statisticians (Namita), and other experts also took part. An overarching theme for discussion was the gender bias in marital prospects, outcome, and satisfaction. Unmarried women with epilepsy seem to be disproportionately affected in comparison to young men with epilepsy. Besides discussing the findings of the survey, the group also discussed and initiated the development of a quality of marriage in epilepsy (QOMIE) scale for marital satisfaction, specifically for people with epilepsy and the merits and pitfalls of a web-based marriage portal specifically for people with epilepsy in the region. We would like to express our gratitude to the WFN for funding this important social venture, which we hope to take forward in keeping with the resolution adopted by the World Health Assembly in 2015 to fight stigma and discrimination faced by people with epilepsy. It affords an opportunity to speak directly with neurologists worldwide and to update them of the changes in the World Federation of Neurology (WFN) that naturally follow a change in leadership and to acknowledge the contributions of many. Lewis, elected trustee, who joined the meeting on Tuesday. To Raad Shakir, who has stepped down at the completion of his four-year term as president, the re-election of Riadh Gouider as trustee for another three years, and to those who unsuccessfully contested elections held during the WCN Kyoto, I offer my congratulations for their effort and gratitude for their demonstration of commitment to the work of the WFN. This time also marks the end of the two years that the WFN committee chairs and many on the committees will have served. Traditionally, there is a change in personnel in all committees every two years. To them, on behalf of the WFN, I thank you wholeheartedly. Without their unselfish involvement and valuable contributions, the WFN would not run as smoothly and as successfully as it does. As with many committees, their contribution largely goes unnoticed by the membership but certainly not by the officers and trustees. Without a doubt, however, the contributions of Raad Shakir as president for the last four years was outstanding. Consequently, although there is much to inform you of, I intend to limit this for now and spend the bulk of this report touching on the successes of Dr. Shakir’s term. Dr. Shakir has been a prominent figure in neurology in the United Kingdom for more than 20 years and was one of the key people in the organization of the successful 2001 World Congress of Neurology, which was held in London. My acquaintance and knowledge of him began at that time and has largely paralleled my own involvement with the WFN. I have been fortunate to witness first-hand the contributions he has made to our organization. Officers, trustees, and regional presidents attending the combined strategy meeting in London. From left to right: Riadh Gouider; Franz Fazekas, president-elect, European Academy of Neurology; Yomi Ogun, president, African Academy of Neurology; Morris Freedman; Richard Stark; William Carroll, WFN president; Marco Medina, president, Pan-American Federation of Neurological Societies; Wolfgang Grisold; Ralph Sacco, president, American Academy of Neurology; Beom-Seok Jeon, president, Asian and Oceanian Association of Neurology; and Ryuji Kaji. He has provided dedicated service over many years, aided by his multicultural education and experience, and his seemingly boundless energy and enthusiasm. With his detailed understanding of the varied cultural sensitivities in the global neurological community, he has been a successful leader. Before being elected to the position of WFN’s Secretary-Treasurer General in 2009, he had assumed this position in 2006 on the unexpected retirement of the incumbent and he immediately displayed these skills and commitment in this new role. With then-WFN-President Johan Aarli, he was able to negotiate an understanding with the Peoples Republic of China that enabled the Chinese Neurological Society to join the WFN without fracturing the memberships of the Hong Kong and Taiwanese neurological societies. This was no easy task, as two previous presidents had been unsuccessful in the same endeavor. His presidency of the WFN commenced in 2013 and was marked by a commitment to empower the regional organizations of the WFN. This was crowned by the establishment of the African Academy of Neurology (AFAN) in 2015 and its first Congress in 2017 in Hammamet, Tunisia. Although Dr. Shakir did not instigate the WFN African initiative in 2006, there is no doubt in my mind that it was his vigor and leadership that enabled the initiative to be transformed into AFAN as an active and independent regional affiliated WFN organization. At the same time, Dr. Shakir has also prosecuted the African initiative plan for the WFN to develop four neurological training centers, two in Anglophone and two in Francophone Africa. A major limitation has been the funding of trainees in these centers. Through his persistence and endeavor, enduring funding is now being established that will benefit neurology in Africa. Such an outcome will both free up valuable WFN funds for additional educational projects and elevate the visibility and support for the WFN. The benefit of the increasing recognition of the WFN as a leader in neurological education in one of the most difficult yet needful areas of the world will pay dividends for many years, particularly in lifting the standard of neurological care in Africa. The final development and the establishment of the Pan American Federation of Neurological Societies (PAFNS) also occurred in Latin America during his presidency. It is fair to say that his influence and guidance were fundamental in driving this successful outcome. As a consequence of these two initiatives, the WFN now has affiliated regional organizations in six areas, approximating those of the World Health Organization (WHO). Importantly, these afford more effective and immediate interaction between the WFN and the regions and regional member societies. It is no boast to say that the vision of regional empowerment is transforming communication within the WFN and that this in turn advances engagement at all levels of the WFN. Dr. Shakir has displayed the same dedication and skill in guiding the WFN dealings with the WHO. Intimate involvement with WHO-related activities such as the Neurology Atlas of 2017, and in him heading the neurology Topic Advisory Group for the revision of the International Classification of Diseases (ICD-11), have required enormous effort, patience, and skill over a considerable period of time. The WFN and the global neurological and stroke communities are indebted to Dr. Shakir for his Churchillian doggedness in dealing with the WHO, which at times has appeared out of touch with reality and driven by internal bureaucratic imperatives. The interaction between the WFN and the WHO is leading to a fundamental change in the way the WHO views stroke (as a disease of the brain), and this should be reflected in ICD-11. Both will be advantageous to the advancement of neurological care worldwide. The outbreak of the Zika virus in early 2015 afforded another example of Dr. Shakir’s ability to mobilize rapidly the required WFN response. Within weeks of it becoming recognized as a major threat to health, particularly to fetal health and a potential risk for children and adults of an acute paralytic illness resembling Guillain-Barre syndrome, the WFN had in place an international committee of experts headed by Prof. John England. The WFN Zika experience, particularly the need to act rapidly with other organizations in developing a multiskilled response, gave direction to the role of the WFN as a natural lead point for like organizations. Both the World Brain Alliance and the Global Neurology Network, which commenced life under President Hachinski and Vice President Hacke, respectively, are natural partners for the WFN. Dr. Shakir has recognized this “natural fit” and has emphasized the important role all three may need to play in the future. To assist this relationship, he made special provision for all to be involved in the biennial WCN scientific program. It is fitting that Dr. Shakir’s presidency should terminate with arguably one of our most successful World Congresses of Neurology, in Kyoto. By numbers of delegates (more than 8,500), number of participating countries (110), number of bursaries offered to young neurologists from low- and low-middle-income countries (200), and our most profitable despite the highest dollar value support for the faculty to make them feel appreciated, it was a success. As the chair of the Congress committee for 2017, I can attest to both the efforts of the Japanese Society of Neurology and Dr. Shakir’s guiding influence in the success of this WCN1. Dr. Shakir will be missed, but as is his nature, he has offered his advice and service should they be needed in the future. We all wish him and his wife, Nada, the best of futures and more quality time for each other and their extended family. I will now briefly summarize some of the other developments since Jan. 1, which will be dealt with in more detail in my next reports. 1. 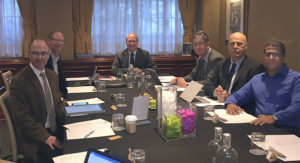 The trustees and officers of the WFN met in London in mid-February for a strategic planning meeting and were joined by the presidents of the six regional organizations. The full complement of attendees met over two consecutive days of intense discussions, preceded and succeeded by more specific and focused topical meetings which all lasted four days. 2. The outcomes were a thorough review of WFN education and related programs, including the annual research Grant Program, Department Visits, regional teaching courses in Africa, regional training Centers in Africa, plans to ensure the successful continuation of the AFAN, interaction with the West African Academy of Medicine, and the goals, financing, and outcome measures of all training centers before they are established, and a review of support for trainees in these programs. All in all, once implemented, these measures should ensure their successful continuation. 3. Review and revamp of website, social media platforms, and publications (mainly World Neurology) with uniform external branding. 4. Preliminary work on the needs registry to be developed by the regional organizations with their member societies. 5. A review of each committee and its role, activity, and constituents. 6. An agreement to hold this same strategic review biennially. 7. A review of the AAN/WFN Continuum program developed new criteria for its continuation, which will be instituted gradually and involve an appeal process to minimize any inadvertent hardship. 8. Importantly, it was agreed to hold the following meetings during 2018. 8.1 Congress Committee incorporating the 2019 Scientific Program, Teaching Course Committee, and Tournament Committee meeting in April during the Los Angeles AAN meeting — dates to be confirmed. 8.2 Finance Committee and other WFN Committee meetings during the EAN meeting in June in Lisbon — dates to be confirmed. 8.3 The Council of Delegates and AGM of the WFN including the election of a Secretary-General and an elected Trustee, in October during the Berlin ECTRIMS meeting — dates to be confirmed. All 2016 constituted committees will be advised in the near future whether they will continue to operate into 2018, join with the newly constituted 2018 committees for a variable period, or disband. It was clear to all who attended the strategy meeting that it was informative and empowering, and the inclusivity was team-building, which bodes well for the progress of the WFN through 2018. Finally, in closing and in the interests of openness and transparency, the executive of the WFN would be pleased to engage in dialogue at any level on these and any other matters. Until next time, I wish all a successful and productive 2018. 1. Carroll W M (2017). The need for a Global Neurological Alliance, JNeuroSci. 379;321-323. Richard Bertram Godwin-Austen came from an illustrious English family. His ancestry can be traced to the reign of Richard II in the 14th century. His 19th century ancestors included two Fellows of the Royal Society, Robert Alfred Cloyne and Henry Haversham. The latter extensively surveyed the Karakoram region of the Himalayas establishing the height of K2 (for a while known as “Mt. Godwin-Austen”). Richard was born in 1935, and during World War II, his father was posted as a surveyor for the colonial office in Cyprus. Richard and his brother were sent to South Africa for the period of the war. He returned to England in 1945 and was sent to a boarding school. He started his medical studies at St. Thomas’s hospital a few years after the establishment of the British National Health Service. He qualified in 1959 and did his early training in St. Thomas’s hospital in London. Richard decided to train in neurology. In 1961, he married his first wife Jane. He did some of his early training in Exeter, returning to London in 1963. He worked with Michael Kremer at the Middlesex Hospital and Roger Gilliatt at Queen Square. Gilliatt was the son of the Queen’s obstetrician and fought in the Italian campaign and was awarded an MC. He had great power over British neurology for decades. There were few consultant neurologist posts in the 1960s. At the time, Richard was working at the National Hospital as a senior registrar. In 1970, Michael Harrison (later professor) suggested to Richard that he should apply for a consultant post in Nottingham. Harrison had already applied for the post, as he previously worked with the senior physician in Nottingham and they both thought it would be a good experience for Richard to attend a consultant interview. To the surprise of all, Richard was offered the job. He then spent all of his professional life in Nottingham. In June 1996, he had to face a life-changing tragedy. He and his wife were involved in a terrible car accident, in which Jane died. Richard was devastated by the loss, badly injured himself, and soon after had to consider early retirement. The relationship to the WFN started when Richard attended the World Congress of Neurology Kyoto 1981. He presented the first clinical paper on MRI imaging of six patients. The chair of the session moved the presentation forward, as the previous presenter did not attend. When Richard finished the presentation, the hall filled up and the chair was asked if Richard could present the paper again, which he did. This was probably the first and only time that a paper was repeated in a World Congress. One has to mention that Bill Moore, a young physicist in Nottingham, conducted the initial research into the clinical application to create an image using magnetic resonance. The safety of the technique was tested on an onion, his wrist and his head. The other two involved were Peter Mansfield and Godfrey Hounsfield. Peter Mansfield received the Nobel Prize for his work; he died in 2017. The Secretary-Treasurer General of the WFN is the dynamo of the Federation. Frank Clifford-Rose’s two terms in the post were coming to an end. Richard was asked to apply, and he was elected during the Buenos Aires WCN 1997. He served two terms, including a most successful WCN in London 2001. During that time, he worked tirelessly to organize the London office with the help of Keith Newton, the WFN administrator. He worked mainly with James Toole and Jun Kimura as WFN presidents. 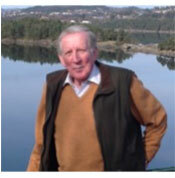 As the Secretary-Treasurer General term overlaps, he also worked with John Walton and Johan Aarli. These were formative years for the WFN when the basis of training centers and programs were initiated. Meanwhile in 1997, Richard married again. He had known his second wife Sally since the 1950s. She had moved to the United States, and their paths had separated before his first marriage. By serendipity, they met again, and he found new happiness. His involvement with the WFN continued until less than three months before his unexpected death. Richard presented a fantastic paper on “Nottingham and the Early Days of MRI Scanning” at the XXIII WCN in Kyoto in September 2017. The paper focused on the ideas (the Eureka moments), which contributed to the developments. He and his wife Sally enjoyed their trip to Japan, and they met many friends in the World Congress. His involvement with the WFN started and ended in Kyoto, spanning a period of 36 years. In the late 1960s, Richard was involved in research in Parkinson’s disease, and his book ‘The Parkinson’s Disease Handbook” has been a major resource for patients and their families. He was elected president of the Association of British Neurologists 1997-1999, vice president of the European Federation of Neurological Societies, as well as serving on the council of the Academy of Experts, the European Board of Neurology, Parkinson’s Disease Society, and the Nottingham Medico-Legal Society. Of huge interest to his international friends was his appointment as the High Sherriff of Nottinghamshire. He was an enthusiast for whatever he did, whether it was in the field of art, music, fishing, dancing, Chinese snuff bottles or Japanese ceramics, or the paintings of David Bomberg, of which he owned a few. His memoirs “Seizing Opportunities: The Reminiscences of a Physician” is a most delightful read for all to enjoy. His character was that of a true gentleman and has always been a loyal friend to all who knew him. He will certainly be missed. Richard passed away suddenly on Dec. 3, 2017, at the age of 83 years. He is survived by his wife Sally, two children Jonathan and Alice, six grandchildren, and three stepsons. Prof. Raad Shakir served as president of the WFN from 2014-2018. 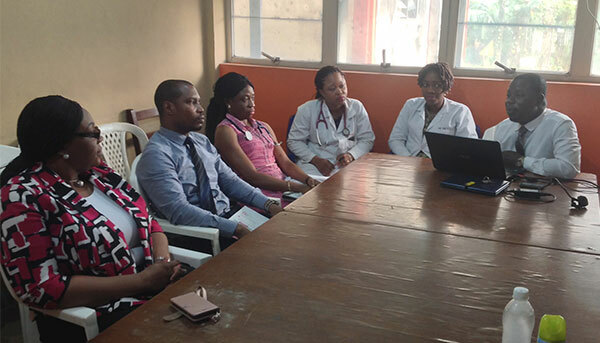 Neurology training at the Lagos University Teaching Hospital (LUTH) Nigeria is conducted using the guidelines of and under accreditation of the West African College of Physicians and the National Postgraduate Medical College of Nigeria. The training features two stages: Junior Residency (initial 24 months in internal medicine, inclusive of a mandatory three-month rotation in neurology) and Senior Residency (specifically, for specialization in neurology, an additional 36 months in general neurology, including rotating through relevant subspecialties). The LUTH program is one of the largest in Nigeria, and has an average of 90 resident doctors in internal medicine at any point in time. Of these, about half are junior residents, five are neurology senior residents, and the rest are senior residents in various specialties, such as cardiology and endocrinology who mandatorily undertake rotations in neurology also. The Neurology Unit also trains residents rotating from neurosurgery, ophthalmology, family medicine, anesthesia, and psychiatry. The training format includes clinical teachings (outpatient and inpatient setting), self-directed learning, didactic lectures, grand rounds, postgraduate seminars, journal reviews, and conference attendances. The American Academy of Neurology’s (AAN’s) Continuum Lifelong Learning in Neurology® has been provided by a joint program of the World Federation of Neurology (WFN) and AAN to our training program for about nine years. During the early years of its use, neurology residents and the trainers (consultant neurologists) used the journal as part of the recommended reading and material for postgraduate seminars. Continuum-Based Early Bird Seminars: This is a year-round postgraduate seminar held on most Tuesday mornings from 8 a.m.– 9:30 a.m. The seminar topic is preselected from Continuum, topics are distributed to be read by all, and presented by one of the neurology senior residents. The seminar is attended by 10 to 12 residents rotating through the unit at the time, with consultants in attendance also. The format is via PowerPoint presentation, with interactions (questions, clarifications), and a brief post-test of a few (four to five) multiple-choice questions (MCQs) based on the content for the day. The residents have indicated that the sessions are valuable, and have improved their understanding and knowledge because of the combination of functional/anatomical/pathophysiological basis, real-world symptoms-based algorithms/approach to common neurological complaints, updates on classifications, diagnostic criteria, and evidence-based treatment guidelines. In addition, the post-reading MCQs and patient management problems with responses improve the understanding of the material. Incorporation of Continuum Into Training Curriculum: As the chair of the Neurology Subspecialty of the National Postgraduate Medical College of Nigeria, in our recent curriculum revision, I have included the Continuum journal as part of the recommended reading material for all residents training in neurology. This is in recognition of the invaluable content delivered by global experts in each subject, and the realization that, with this exposure, our residents have access to a journal that is easily the best educational content for any training or practicing neurologist. Examiners at the postgraduate examinations have continued to be impressed by the level of knowledge displayed by our trainees, and how well rounded and balanced they are in their clinical approach, diagnostic evaluation, and grasp of evidence-based treatment modalities. Much of this is a testament to the ease of access to the comprehensive, up-to-date, yet clinically relevant compilation of neurology contained in the Continuum series. In the foreseeable future, as there is a plan to harmonize training curricula of all of the postgraduate medical colleges across the West African sub-region, it is highly probable that this existing curriculum recommendation will be reflected in the West African Neurology Training curriculum as well. I strongly appeal that the program be continued. The level of confidence that comes from knowing that one is learning from global experts, and the knowledge is at par with what other neurologists globally are learning, is a boost to the confidence of our trainees and ourselves. Prof. Okubadejo is a consultant neurologist at the Lagos University Teaching Hospital and subspecialty chair (neurology) at the National Postgraduate Medical College of Nigeria. Specialization in medicine started during the second half of the 19th century. Several causes have been presented, including an increase in occupational diversity in Western society, the change from humoral to solid medicine, the appearance of theories on localized lesions versus diffuse causes (reflected for instance by monographs on diseases of one organ), the foundation of asylums and hospitals for particular diseases, and (later on) the fact that certain areas of medicine became too large to be dealt with by one type of physician. Although there was considerable opposition to this change, specialization continued as can be observed by the increasing number of specialized societies and journals, the publication of large specialized handbooks, the introduction of specialties in the medical curriculum, and the organization of congresses for specialist physicians. Neurology as medical specialization was not among the first new specialties, and in many countries arose associated with psychiatry (which was an early specialization). Other diseases, nowadays belonging to neurology, were taken care of in internal medicine departments or special outpatient clinics arising from internal medicine (for instance outpatient clinics for electrotherapy). International congresses for (general) medicine were organized regularly, one of the best known being the one in 1881 in London. According to a report in the BMJ of Aug. 13, 1881, “3,000 men have been gathered in Congress throughout the week, and among them the choicest spirits of the age.” (See Figure 1.) Indeed, well-known names were mentioned, including Pasteur, Lister, Bastian, Bigelow, Erichsen, and Crichton Browne. It was at this congress that the famous discussions on cerebral localization, following Broca’s 1861 clinical findings and the electrical stimulation experiments by Fritsch and Hitzig in 1870, took place and David Ferrier demonstrated his experimental monkeys, urging Jean-Martin Charcot to exclaim that the monkey resembled hemiplegic patients. 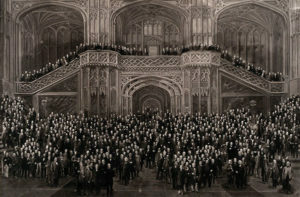 The large number of visitors at the congress was another indicator of the necessity of future meetings in smaller groups. One of the first, possibly the first, neurology meeting, the International Congress for Psychiatry, Neurology, Psychology, and Care for the Insane was organized in Amsterdam in 1907. Even at this early specialized congress, 805 delegates were present (21 nationalities, price for registration 10 guilders/3 $). 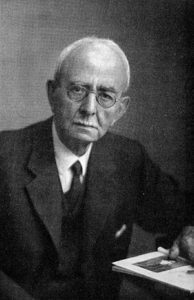 Many well-known neurologists met, including the Belgian Arthur van Gehuchten, the Germans Arnold Pick and Hugo Liepmann, and the Swiss Constantin von Monakow. In 1914, the Swiss were organizing an international meeting solely for neurology in Berne. The correspondence between Swiss neurologist Constantin von Monakow and his Dutch colleague and friend Cornelis Winkler tells about the organization in September of that year. 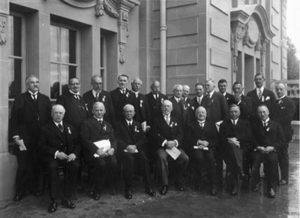 Although dozens of letters about resurrecting the International Brain Commission (founded in London in 1903 and an important platform for international communication with respect to neurology, including the basic fields) have been written between neurologists/ neuroanatomists during the period 1918-1931, the organization of the congress finally took place in 1931, now considered the first in a long series, such as the 23rd meeting in Kyoto, Japan (2017). It is a pleasure to leaf through the Proceedings of the congress (published in 1932 by Stämpfli, Switzerland). The book was put together by a team of neurologists (Bernard Sachs and Henry Alsop Riley of New York, Charles Dubois, R.F. Fischer, and Pierre Schnyder of Berne), and chaired by Bernard Brouwer of Amsterdam. The introduction was written in four different languages (English, French, German, and Italian). 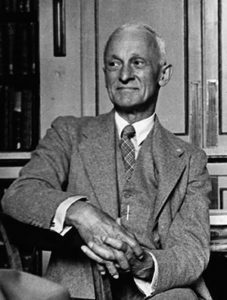 During the opening ceremonies on Monday, Aug. 31 (1931 at the Casino of Berne), the rector of the local university conferred honorary degrees of medicine to Harvey Cushing (see Figure 2), the famous founder neurosurgeon, who had done experimental research (with Theodor Kocher and Hugo Kronecker) in Berne 30 years previously, and to Sir Charles S. Sherrington (see Figure 3), the well-known neurophysiologist (who would be awarded the Nobel Prize in 1932). The laudatios were read in Latin. 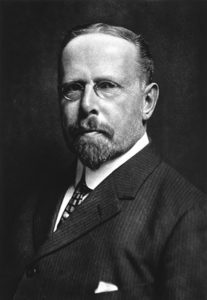 The presidential address, also printed in the four languages, was given by Bernard Sachs, who at the time was also president of the American Neurological Association. Figure 4. Representatives of the various participating countries in Berne (1931); sitting from left to right: 1 Gheorghe Marinescu (?) 2 Max Nonne 3 Charles Sherrington 4 Bernard Sachs 5 6 and 7: unknown. Standing from left to right 1 unknown 2 Robert Bing 3 Otto Marburg 4 Ottorino Rossi 5 C.U. Ariëns Kappers 6 Henry Markus (?) 7 George Guillain 8 Robert Wartenberg or François Naville (?) 9 unknown 10 Henri Claude (?) 11 Ludo van Bogaert (?) 12 unknown 13 Henry Alsop Riley 14 unknown. Figure 5. Chairman of the Congress New York neurologist Bernard Sachs (public domain). On the evening of Friday, Sept. 4, a special conference titled, “Relation of Neurology to General Medicine and Psychiatry in Universities and Hospitals of the Various Countries” was organized at the Bellevue-Palace hotel. Neurologists/neuropsychiatrists from several countries spoke about the situation in their own country (Max Nonne on Germany, Constantin von Economo on Austria, Mieczyslaw Minkowski on Switzerland, Jean Lépine on France, Theodore Weissenburg on the U.S., Ottorino Rossi on Italy, and Bernard Brouwer on the Netherlands). Following the discussion, the chairman, Bernard Sachs, (See Figure 5.) asked the assembly to vote the resolution, as proposed by Otfrid Foerster: “Neurology represents an entirely independent specialty in medicine. Unfortunately, this fact has not been sufficiently recognized in various countries. The First International Neurological Congress hopes that the Universities and Hospital Authorities of the various states will take active steps to further the progress of Neurology.” The resolution was accepted unanimously. The influence of the congress and conference may be recognized by the foundations of several independent university chairs and neurological societies in several European countries. It is interesting to note that the “Ladies reception committee” (mainly wives of Swiss delegates) is mentioned in the Proceedings with a report of the “Receptions and excursions.” The second International Neurological Congress would be held in London (1935), after the Association of British Neurologists had been founded in 1932 (at the house of Gordon Holmes). By A. Buguet, P. Spencer, and J. Reis for the Environmental Neurology Research Group. The Second International Meeting on Environmental Health Strasbourg (RISE 2017) was held Nov. 29-Dec. 1, 2017, at the Council of Europe in Strasbourg, France. The conference welcomed WFN President Prof. Raad Shakir and WFN General Secretary Prof. Wolfgang Grisold. As in 2016, the 2017 conference tackled the unresolved mechanisms and effects of air pollution and other environmental exposures on the brain and nervous system. Pollutants in the air take many forms, including gases, fumes, liquid droplets, and solid particulate matter of various sizes. Inhaled fine and ultra-fine particulate matter can enter the lungs, cross the alveolar wall, enter the blood stream, and reach neural tissue either directly (circumventricular organs, sensory, and autonomic ganglia) or after passage across the blood-brain/nerve barriers. An alternative route to the brain is from the nose and across the ethmoid wall to reach the olfactory pathway, whereupon particles can be transported retrogradely to cerebral structures. Particles that are swallowed may traverse the gut wall and enter the blood stream. Particulates that enter neural tissue trigger oxidative stress, neuroinflammation, and cellular damage. Relapses in multiple sclerosis are linked to ambient air pollution. Whether chemical pollutants can trigger disease-inducing expression of latent neurotropic viruses is an unexplored question. Speakers emphasized that chronic exposure to polluted ambient air has important links with neurological disease during development, childhood, adult life, and advanced age. Specific chemicals and mixtures used in industry or to induce euphoria are established causes of peripheral neuropathy and cognitive deficits in children and adults. Chronic exposure to polluted air is an accepted risk factor for ischemic stroke, probably via a cardiovascular mechanism. 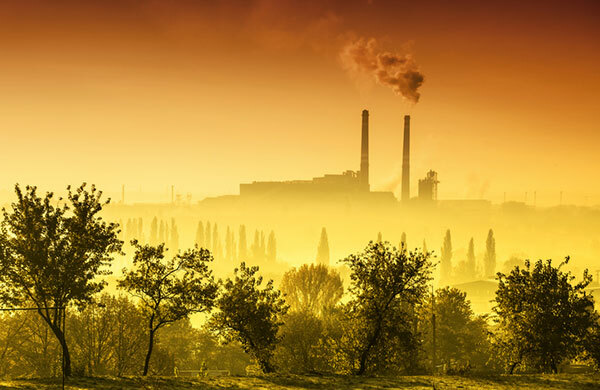 There are major concerns that air pollution increases the risk for disorders of neurodevelopment and brain maturation, resulting perhaps from epigenetic changes that may also have consequences for neurological health in later life and old age. Persistent epigenetic changes (DNA methylation) may be induced by naturally occurring substances, such as methyl donors in nutritional foods and manmade chemicals that become environmental pollutants. Genetic, prenatal, and environmental risk factors have been linked to neuroendocrine disturbances during pregnancy (for example, thyroid gland and hormones) resulting in autism spectrum disorders, the incidence of which has increased and now affect males more than females (3:1). Food and medicinal use of plants containing a potent methylating agent chemically related to substances found worldwide in preserved food and cigarette smoke (e.g. nitrosamines) has been linked to the prototypical neurodegenerative disease Western Pacific ALS-Parkinson Dementia Complex. Tobacco use is a risk factor for Alzheimer’s disease and ALS, but not for Parkinson disease, possibly because nicotine is protective of dopaminergic neurons. High-incidence apparently sporadic ALS has been found in a village in the French Alps. We were honored to receive lectures from both Prof. Shakir and Prof. Y. Le Maho, member of the Académie des Sciences (Paris). Prof. Le Maho, who had been invited to broaden the scope of the conference, lectured on biodiversity. Apart from nutrition, biodiversity renders multiple services to man. It is the source of medical and therapeutic innovations, and of information on restorative processes, on the control of scavengers and pests, on soft chemistry for the development and fabrication of new materials, and even on the use of plants to reduce pollution and increase air quality. The impact of global warming on biodiversity further weakens species endangered by human activities. One of the main lessons is that human impacts on the environment are irreversible. We should learn from biology when addressing environmental impacts on the brain.